Likes to touch my arm while sleeping. Weird cat. This combines two things I used to carry (a portable battery and a charging brick) into a single device. Now I carry one less item. I love when this happens. I ordered one of these to hold my essential tech gear. This includes: the above-mentioned Anker portable charger, my AirPods, Apple Pencil, a lightning cable, a microfiber cloth, a tiny micro USB cable, and a tiny lightning cable (which constantly has my Pencil adapter attached to it). 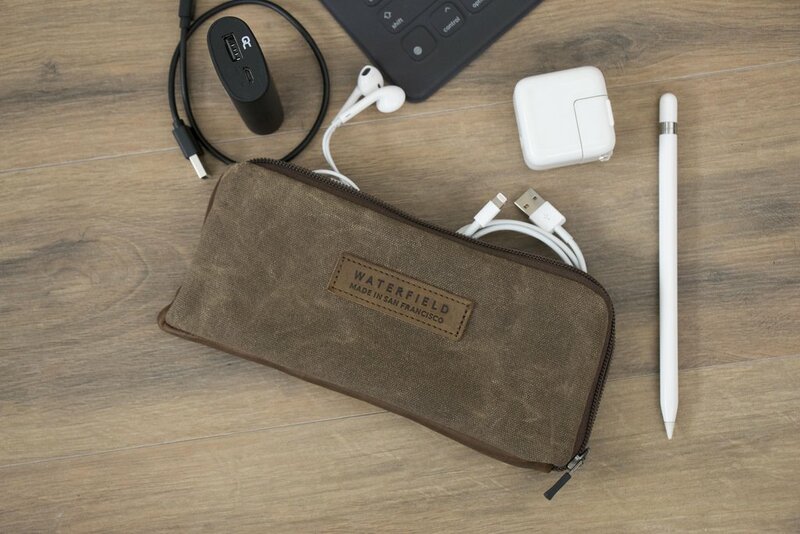 The bag is typical Waterfield quality, which is to say it’s amazing. The waxed canvas is supple and feels great, the locking zippers are sturdy and glide smoothly, and the internal pouches are super soft. Highly recommended. I use Transmit every day. Version 5’s ability to manage SSH keys via the UI is a huge improvement, as using keys in version 4 was confusing. The UI is much improved as well, and they’ve added Panic Sync, so your sites sync across devices. Loving this update. Also? You can buy it using Apple Pay, which is neat. Oldest daughter is a big fan of pizza with pineapple.